July 13, 2015 July 13, 2015 lulu12 Comments on North Haven, Here We Come! North Haven, Here We Come! North Haven Island is an easy 35 minute ride for us on Pipe Dreams, so we head that way often. It is one of the few Maine islands (remember there are thousands) that has a year round population, much of which dates back generations. I guess there are some people who are just born to be islanders. Permanent population is slightly more than 350, and that number swells considerably from June through August when summer residents return to homes that may have been in the family for years. The only way to get on or off the island is by boat. If you’re not lucky enough to have your own, a ferry runs multiple times to and from Rockland. 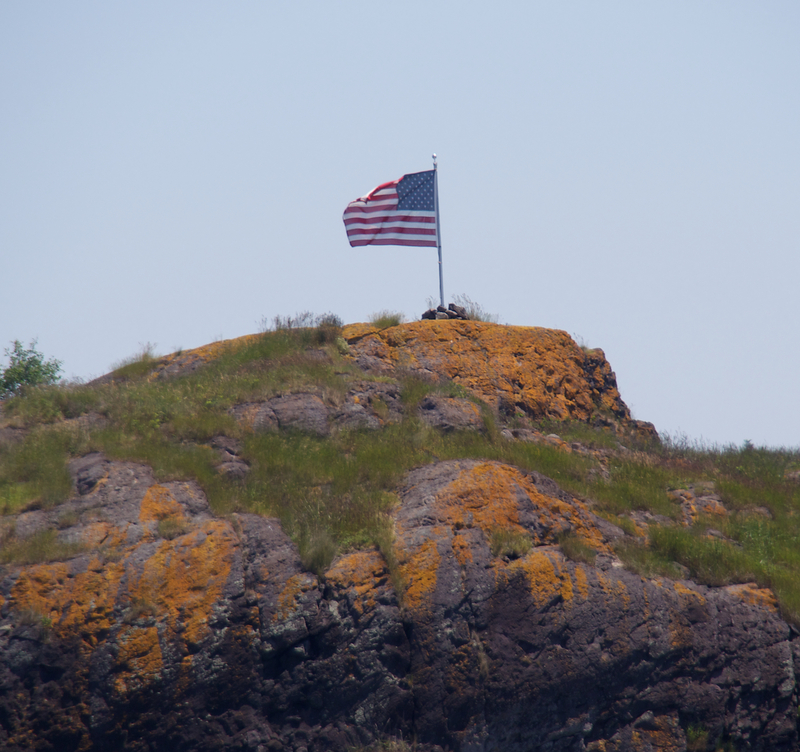 I always know we are close when I spot the lichen covered rocks atop which an American flag waves. One of these days I’m going to find out who puts that flag there and thank him/her for such a welcoming sight. Another clue that we are nearing the island is the abundance of lobster traps which makes us very glad Pipe Dreams has jet engines rather than props that can become entangled in lobster pot lines. From what I’ve seen clearing props is not a fun job! The reason for this visit to North Haven is to have dinner at Nebo Lodge, a popular eatery and one of very few on the island. It is a quaint place, packed in the evening, that serves menu items made from fresh ingredients grown on the island. You might be interested in knowing that a Maine Congresswoman, Chellie Pingree, has played an important role in developing farming on North Haven. Inside, tables are covered with vintage tablecloths, and if one is soiled there’s plenty more from which to choose. Some of you would be envious of the collection. This time of year fresh flowers are on every surface and fill the air with their perfume. I never cease to be amazed by Maine’s summer beauty. Dinner at Nebo is leisurely and relaxing to say nothing about good. What is amazing is that I failed to take a single food shot to whet your appetite. I guess we were in too big a hurry to enjoy! I always love your day trip posts, and this one is another gem! Looks lovely! 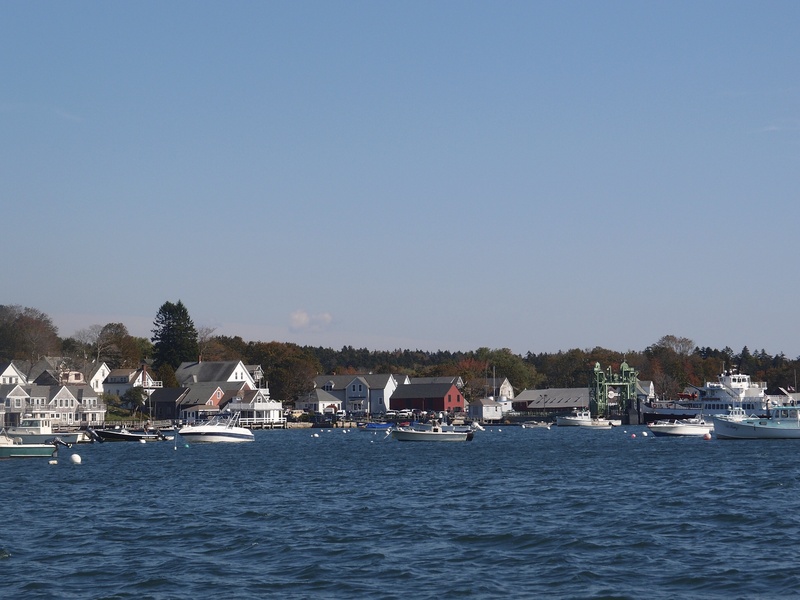 It’s easy to find a good boat outing on the coast of Maine. Thanks for your visit. Love reading about all of your excursions…what an interesting island, but don’t believe I’d like to winter there!!! I enjoy visiting islands but don’t think I’d do well living on one. Linda, I enjoyed taking in the island with you! How much fun it must be to summer in Maine! Have a wonder-filled Tuesday! 23 years and counting and I still love Maine! Such a lovely destination! Love the vintage cloths! Love seeing your Maine posts ~ enjoy your summer fun! The island sounds fascinating….and that couple looks familiar!…. Looks like a great outing.